The symbols of the Geologic Timescale Watch face are the symbols used by geologists to represent the 12 different periods in the geologic timescale. So while the watch keeps regular time, the hands move through hundreds of millions of years of geologic time. 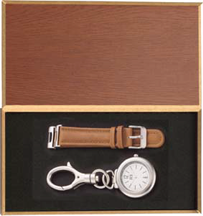 The watch comes packaged in a Wood Grain Box. It changes from wrist watch to fob watch. It has a hardened mineral glass crystal and is water resistant. Ask about special school or company logo orders. Order yours today, Payment accepted through PayPal. . . click the button.